The human body and its workings are very complex. An understanding of good health, typical illness and disease is important, but for a Koistrained dentist, it is just the beginning. A person’s oral condition is a mystery to be uncovered through thorough examination and careful consideration. John Kois enjoys invoking the image of actor Peter Falk, who played a detective in the 1970’s television series Columbo. Detective Columbo always gathered routine information needed to investigate a crime, but solved cases by asking deeper questions, probing for hidden meaning and connections below the surface. Your Kois-trained dentist will gather detailed information about you and your mouth—a thorough and thoughtful search for clues. You will be astonished at the thoroughness and be intrigued by the dedication to understanding your dental condition. The four dental risk groups, as explained in the next chapter, form a current snapshot of you and will raise questions about your mouth. How did your situation arise? Why are your teeth worn? Why are you suddenly getting cavities? Or, how is it that you’re 50 years old and have never had a cavity? Your dentist will need to know about your past dental experience, looking for hints and evidence. Your teeth and gums tell a tale that reveals secrets your dentist can use to help you attain, or maintain, a high level of dental wellness. Diagnosis answers the questions “What” and “So what” about you: What are the conditions currently in your mouth? So what do those conditions mean for your dental health today and in your future? For example, a crack in one tooth may be harmless, while a crack in another tooth may cause destruction of tooth, bone and even neighboring teeth. 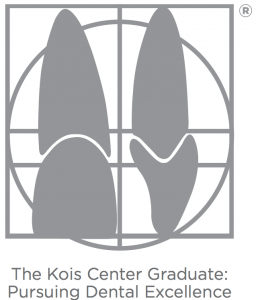 Accurately reading and interpreting the clues in your mouth to make the right diagnosis for you is the hallmark of a Kois Center dentist.